A picture’s worth a thousand words, especially if it’s a NSFW picture set in Ukraine. The Tribe, a silent film about a Ukrainian boarding school for the deaf, was done entirely in sign language, and is being heralded as one of the best films of the year. With no subtitles, no voiceovers, and no translations, viewers become simultaneously alienated and welcomed into a community so quiet that many of us never even noticed it. This is the first feature film for director Myroslav Slaboshpytskiy [who we interviewed last December] and for the non-professional cast of deaf actors. The film opens nationwide on June 17. Check out the trailer here. 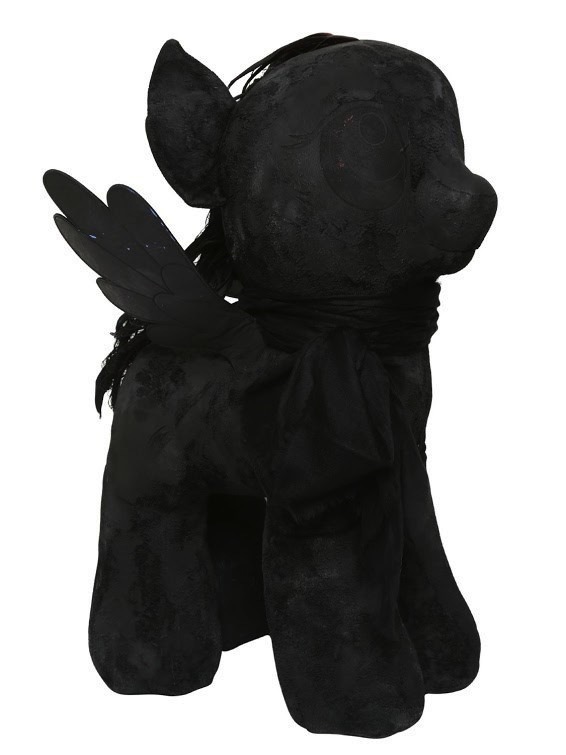 For the most recent incarnation of their signature series of design-collab My Little Ponies, LuisaViaRoma teamed up with Rick Owens, longtime advocate of Donald Ducking, and produced the cutest little black pony anyone has ever seen. The series is sold on eBay and all proceeds go to Save the Children. Etsy just straight up messed with a potentially dangerous group: the metaphysical community. The online retailer updated their rules and regulations this week, banning the sale of all spells, hexes, and potions. Prior to this new, draconian mandate, these transactions used to be tolerated as long as sellers did not guarantee a physical, tangible result. The community did not take the news lying down and have logged a formal complaint citing religious discrimination. This isn’t the first time witches got no love from the web, either: the sale of items used in the occult arts were banned from eBay back in 2012. “‘And what is the use of a book,’” thought Alice, “‘without pictures or a conversation?’” In celebration of the classic’s 150th birthday this year, the original manuscript of Alice’s Adventures in Wonderland will leave its home at London’s British Library and be displayed at New York’s Morgan Library and Museum for the first time in three decades. Visitors will be privy to rarely seen early drawings, Lewis Carroll’s letters, and photographs. The exhibition, on view starting on June 26, promises to trace the creation and publication of this enduring novel. Maybe we can finally find out why a raven is like a writing desk. The lucky students at Canada’s University of Waterloo are about to get the education of a lifetime. The university just announced that they will be offering a course on our beloved Queen Bey next semester. The class will tackle the “Drunk in Love” singer’s career in the context of the media, feminism, and pop culture. Here’s hoping it will teach us how to be ***flawless. Get your towels ready it’s about to go down. YACHT/SEA is now taking reservations for a three-day journey along the California coast starting June 19. The excursion begins in Marina del Rey and ends in Catalina, the quaint island just 22 miles off the coast of Los Angeles. Activities for guests of the yacht fleet include a sailboat regatta and a dance party with DJ Peanut Butter Wolf. All that partying isn’t for nothing, either: portions of the proceeds will go to Heal the Bay, a charity that fights for marine and coastal health. Unique for their graphic style and imagery, Israeli art collective Broken Fingaz has been on the move as of late. Clocking up the not-so-meager mileage between India and downtown Los Angeles, the notoriously subversive group of artists will be marking their debut exhibition in America, Journey Galactiko, at the Howard Griffin Gallery on June 20. The series of gothic pop paintings will be centered around a 150 cubic meter temple that will take center stage, visually depicting their voyage with spiritual motifs that are a mélange of iconography from Indian religion and Western capitalism. With multidisciplinary elements that ensure a good show, you can get a taste for what's in store by watching the teaser video here. When we think of China, we usually think about mass: mass production, mass population, mass pollution. It should therefore come as no surprise that more than half a million people die each year due to airborne contaminants, right? Xiao Zhu, a company committed to providing clean air for those who live in the insalubrious confines of the Eastern powerhouse, is exceedingly wary of this fatal figure and recently made a direct play to bring it to people's attention. Targeting the plumes of smoke from various factory stacks, Xiao Zhu arranged for images of young Chinese people in various stages of suffocation projected into their smoky trial in the night sky, their painful expressions resulting is a resounding call to action against this extremely toxic form of pollution. Watch the video here. KAWS was known for his subversive reworking of public advertisements in the ‘90s, and later, for his distinctive limited edition vinyl playthings that became a hit amongst the global toy collecting scene. Now an iconic footprint on the timeline of street culture, his work has remained hugely desirable to contemporary art aficionados. So the frissons of excitement that ensued when online auction house Paddle8 unveiled a number of these playful objets d'art for sale, came as no surprise. Already well in excess of their reserves, the range of toys on offer include the East Coast artists' beloved Stormtrooper and Pink Chum, as well as a cutesy snowglobe by Jeff Koons. All auctions close at 1pm EST, June 23. She’s not that type of girl, and definitely not that type of rocker. Our favorite Sleater-Kinney guitarist and Portlandia star, Carrie Brownstein is penning a memoir entitled, Hunger Makes Me a Modern Girl (also the title of one of the band’s beloved tunes). Just this week, we got the first look at the cover, here. The book promises to delve into Brownstein’s family background and the infamous Pacific Northwest music subculture. The book will be released October 27. Put a price tag on it. Letters from a young, gay painter: 64k. Iconic German painter, Lucian Freud, wrote a series of intimate letters to poet and critic, Stephen Spender in the early 20th century. The correspondence has led to popular speculation about the relationship between the two, the common theory being that they were more than just intellectual compatriots. The letters are an art artifact in themselves, filled with watercolors and sketches, and hopefully a taste of salacious prose. According to Spender’s son, Lucian was a “most tremendous flirt.” The 10 letters are set to auction at Sotheby’s London on July 2. Courtney Love’s pissed, and the world’s enthralled by yet another Kurt Cobain docudrama. The film examines the iconic musician’s oft-contested suicide, basically arguing that Courtney killed him. Titled Soaked In Bleach, the film has already sparked controversy, with Courtney Love’s posse of lawyers sending irate letters to every theater showing the film in the country. The film’s producers responded in kind, deeming the letter a “a cowardly attack on the rights of free speech, free expression and free choice.” Watch the trailer here. Edited by Elaina Ransford and Emily Nimptsch. Contributers Include: Alberto Gonzalez, Steffi Keung, Eugenia Kim, Jillian Sutton, Cecilia de Cardenas, and Madeline Saxton-Beer.